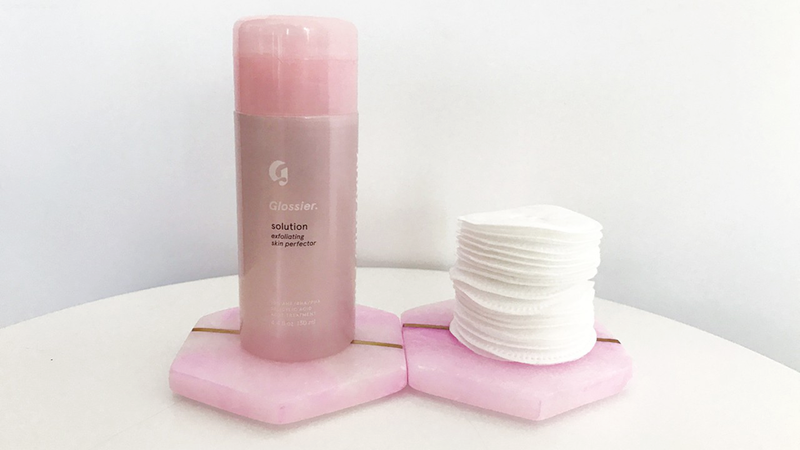 Anytime Glossier has a new launch, the beauty world more or less explodes— frantic orders are placed, the Showroom gets flooded with crazy-eyed shoppers, and the reviews and Insta-hype pour in. Well friends, today is one such day. The beauty leader has just released their latest answer to dull, spotty skin in the form of a chemical exfoliant, amply called Solution. And if it's anything like their other skincare innovations, I'm ready to have my socks knocked off. Packed with a blend of three acid actives, Solution contains Alpha Hydroxy Acid, Beta Hydroxy Acid and Polyhydroxy Acid to slough away dead skin cells and reveal softer, smoother skin. With regular use, this product claims to clear up acne and blackheads, reduce pore size (yes please) and minimize redness— a tall order, but I have faith. Unfortunately for me this product doesn't launch in Canada until January 29th, but you know what I'll be doing at the end of the month. If you live in the States, you can shop Solution here (lucky bastards).